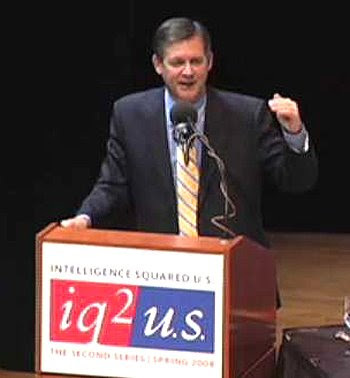 Late last year, I was selected to participate in a debate sponsored by the Rosenkranz Foundation's series, "Intelligence Squared-U.S." This debate was titled, "Tough interrogation of terror suspects is necessary." Although my side - FOR the motion - did not prevail, you can make you own decision. Here is a You Tube clip of my initial presentation. 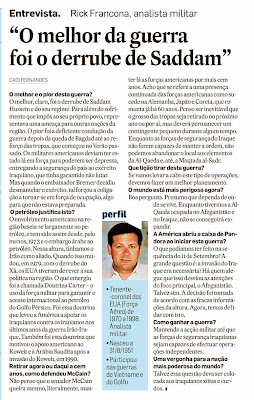 I was interviewed by the Diario de Noticias newpaper of Lisbon. Click on the image for a larger, readable copy - if you can read Portuguese. Click here for the online version, also in Portuguese. I have included a rough translation below. Q - What was the worst and the best of this war? A - The best, of course, was the removal of Saddam Hussein and his Baathist regime. Aside from the suffering imposed on his own people, he represented a threat to other nations in the region. The worst was the poor execution of the war after the fall of Baghdad up until the surge that began last summer. 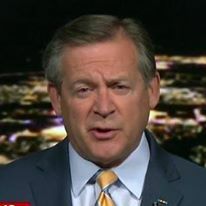 The US military should have been in there and out quickly, turning the security of the country over to the Iraqi army that had agreed not to fight. When Ambassador Bremer disbanded that army, it forced the coalition to become an army of occupation, something it was not prepared for. Q - Is oil worth this result? A - American involvement in the region is largely based on oil, and has been since at least 1973 and the Arab oil embargo. At that time, we had the Iranians as an ally. When that changed in 1979 with the overthrow of the Shah, the United States had to reassess its policy in the region. What emerged is now called the Carter Doctrine – use of military force to guarantee international access to Persian Gulf oil. It was that doctrine that led America to support Iraq against the Iranians in the latter years of the Iran-Iraq war. It was also that doctrine that led to American support of Kuwait and Saudi Arabia following Iraq’s invasion of Kuwait in 1990. Q - Some say that the Americans should withdraw, the sooner the better. Others, like McCain, by the contrary, that US military presence in Iraq should last a hundred year. What is your opinion? A - I don’t think Senator McCain meant he wanted to keep American forces there for literally a hundred years. I think he was referring to the continuing presence of U.S. forces in areas such as Germany, Japan and Korea going back in some cases over 60 years. I think it is inevitable that the bulk of American troops will be withdrawn in the next year or so, but that there will continue to be a small presence for some time to come. As long as Iraqi security forces are not capable of maintaining order, we cannot abandon the place to the likes of al-Qaeda in Iraq or even Muqtada al-Sadr. Q - Which lessons should America and the rest of the world take? A - If you are going to conduct these kinds of operations, do better planning. Q - The world today is more dangerous that it was? A - Good question. I guess it depends where you live. As long as we have al-Qaeda engaged in Afghanistan and Iraq, it is difficult for them to reach out effectively beyond there. Q - Did we open Pandora’s box? A - What were we to do in the aftermath of September 11? The big question is - was the invasion of Iraq necessary? Some claim it diverted the main focus from Afghanistan, maybe so. Given the poor intelligence at the time, the decision was made. Now we have to deal with it. Q - How can Americans win the war? A - Continue the surge until the Iraqi security forces are capable of independent operations. Q - Is this a shame for the most powerful nation of the world? A - Perhaps this is a question for the Shia and Kurdish Iraqis. Note: While not specifically related to the Middle East, American military forces will rely on the replacement tanker for the KC-135 and KC-10 for decades to come - that includes operations in the region. This tanker aircraft KC-30 (now the KC-45A) is made by Northrop Grumman, which partners with a European company. The U.S. military chose them over Boeing to build airborne refueling planes. A decision by the U.S. Air Force to use foreign-made planes over domestic ones is causing a stir in some U.S. military circles. On Friday, the Air Force awarded Northrop Grumman Corp. a $35 billion contract to build airborne refueling planes. While Northrop Grumman is an American corporation, it is actually the American partner of European Aeronautic Defence and Space Co. (EADS), the parent company of Airbus. 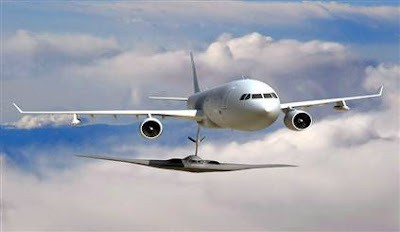 If the deal stands, the U.S. Air Force refueling fleet will take to the skies beginning in 2013 in a European-designed and built tanker based on the Airbus A330 airliner. The military chose Northrop Grumman's bid or a competiting one from Boeing, who proposed a tanker based on its 767 airliner. The deal over the lifespan of the contract could be worth as much as $100 billion. The A330 is built in Toulouse, France. Northrop Grumman/EADS has committed to the “final assembly” of the KC-45A in Alabama, but it is difficult to determine how much of the aircraft will actually be manufactured in the U.S., or whether the factory in Alabama has been built. With the economy slowing, fears of recession and Congress about to add over $150 billion to the deficit in a rebate program designed to stimulate consumer spending, the Air Force decides to buy a foreign aircraft. Nice try, general. Painting an American flag on the tail of an aircraft does not make it an American tanker. It makes it a French tanker with an American flag on the tail. The key issues here are the effect of this contract on the U.S. economy and the potential impact on our national security. While presidential candidates criticize American companies for exporting jobs, we have the Defense Department planning to do just that. These are not minimum wage jobs and these are skilled jobs in the high-technology aviation industry. According to Boeing, had it won the contract, it would have meant the creation or retention of about 44,000 jobs in the United States. Although Airbus claims its contract will “support” 25,000 jobs, it is difficult to see how. At most, 2,000 new jobs is probably more accurate and Airbus has a history of overestimating these things. Congress still has to fund this contract. At a time when we are facing record oil prices and a declining dollar, should we be exporting jobs and procuring a foreign military aircraft? How much will spare parts cost if prices are tied to the Euro? To be fair, Airbus builds a quality aircraft. The A330 airframe is larger than the Boeing 767 and thus carries a larger payload, fuel, cargo or troops, farther. That said, if the Air Force wants or needs a longer range tanker-transport, it should have made that part of the initial requirement. The Boeing 767 meets the Air Force requirement as stated. If the Air Force had stated a requirement for longer-range transport capabilities, there is a Boeing option based on the larger 777 airframe. I suspect Boeing will exercise its right to protest the award of the contract to Northrop Grumman/EADS. Historical precedent for successful challenges is not promising, but there is an added vital component here — national security. Relying on foreign suppliers of military equipment is not in our national security interests. What if France decides it does not support or condone a future American military operation somewhere in the world and prohibits French companies from supplying parts to the U.S. armed forces? The new tanker will be the backbone of the American refueling fleet for the next half century. We cannot predict the long-term political situations in other countries that could affect our access to spare parts. To add weight to the national security argument, let us not forget that we have done the same thing to other countries in the past. For example, Pakistan and Libya ordered and paid for American-built aircraft, F-16 fighters and C-130 transports, respectively, only to find that delivery was blocked by Congress. We should not put ourselves in a position to have our foreign policy held hostage by the whims of another country. The Airbus A330-based tanker is a fine aircraft, but it is a fine French aircraft. The United States Air Force needs an American aircraft.